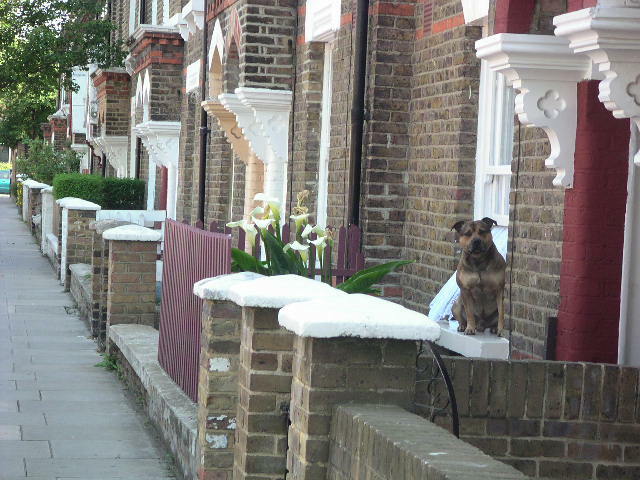 In this special report we reveal the mish-mash of breeze blocks, picket fences and gaps that still stands in place of the stripped ironwork in London today. 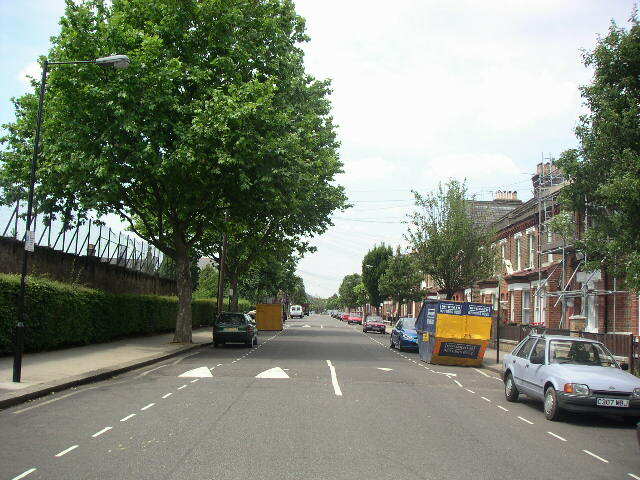 Examples can be found throughout the city and country, but here we concentrate on our neighbouring district of Queens Park, a designated Conservation Area. 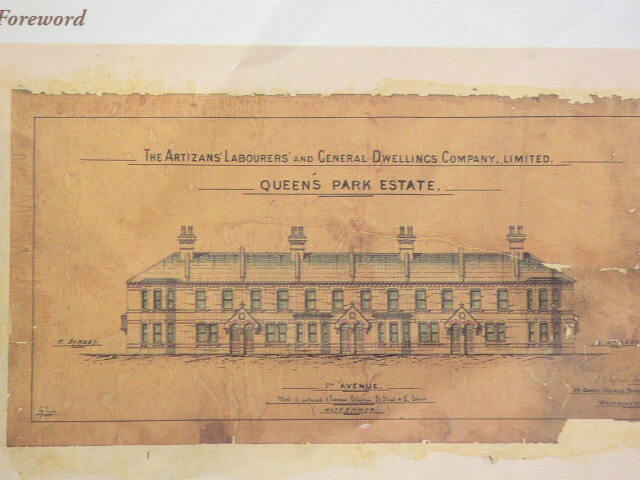 The Queens Park estate was planned and built by a Victorian philanthropic society about 1875, to provide decent accomodation for workers who were crowding into city slums as the industrial revolution gathered pace. They specified the best modern amenities at the time, superb craftsmanship and decoration, with wide thoroughfares arranged in grids like planned cities such as New York, a grid of avenues, numbered First through Sixth, and streets labelled A to O. 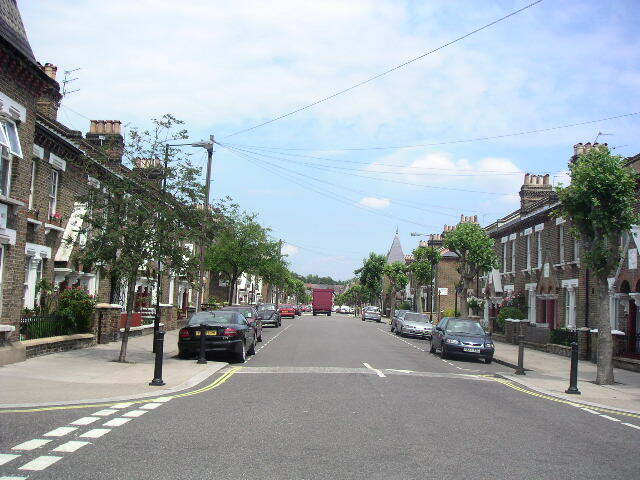 The London A to Z lists fourteen First Avenues, by the way. 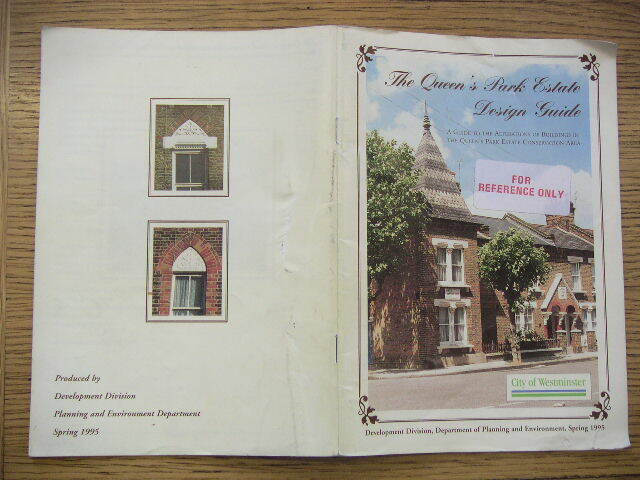 Queens Park is in W10, City of Westminster. 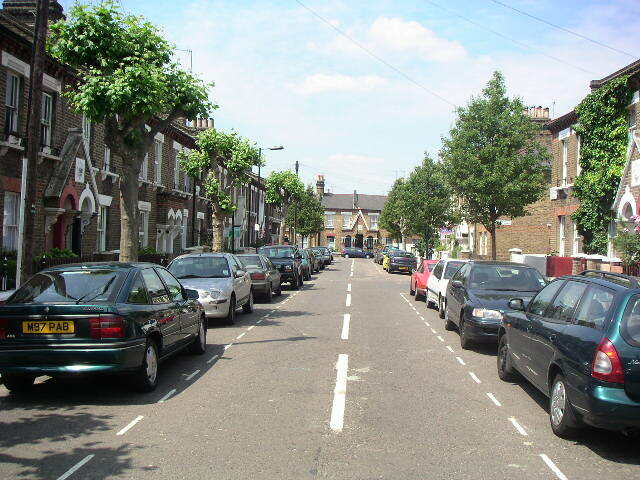 The streets were subsequently given names starting with the letters A to P, drawn from those who were instrumental in their building: Alperton, Barfett, Caird, Droop, Enbrook, Farrant, Galton, Huxley, Ilbert, Kilravock, Lothrop, Marne, Oliphant and Peach. This is what the ironwork should look like. It is thought that the exercise of removing the ironwork was largely for propaganda purposes to raise morale by giving blitzed Londoners the impression that they were contributing to the war effort, and so minimise despair or revolt. Aluminium and some other metals were in short supply, so some pots and pans collected would have been recycled, but cast iron was secretly ferried down the Thames and dumped, so much of it that it became a hazard to shipping. 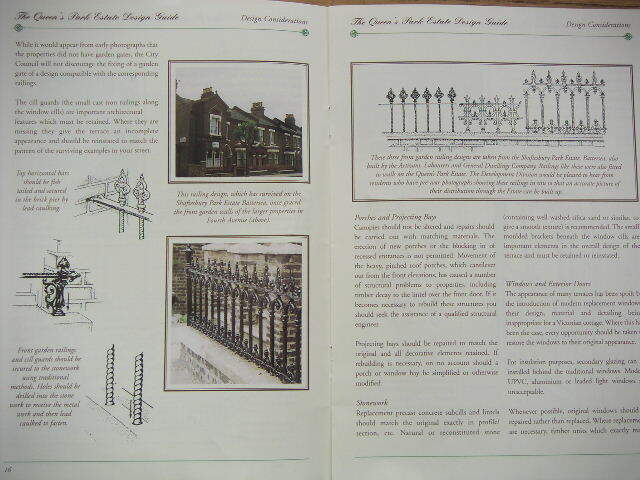 Ref: London's Lost Railings in WW2. 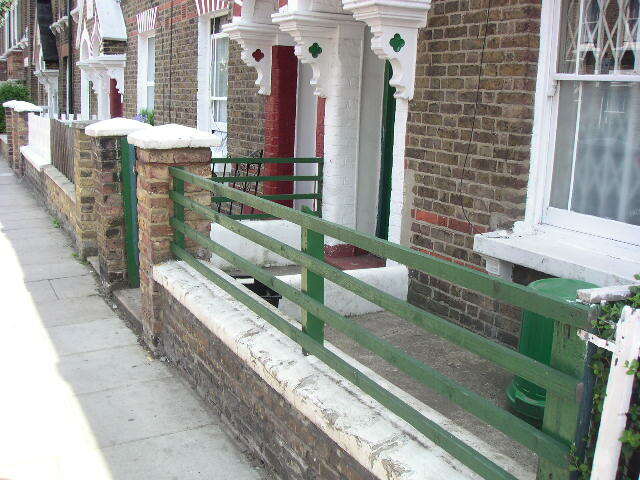 Above is an example of the mish-mash of fencing that has replaced the railings. You can see where the cill guards are missing too. This charming fellow would not be able to sit where he is on the window cill if the cill guard hadn't been removed. Note the missing railings. 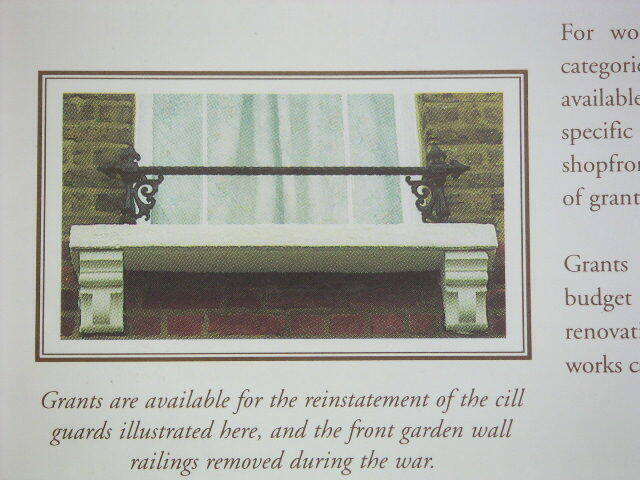 Some of the cill guards have been replaced or partially replaced. It is a very expensive exercise, and your non-roving reporter could never afford it when he lived in a beautiful two-up-two-down not dissimilar to one of these. Here you can see the worst and best that can be done with the old buildings. 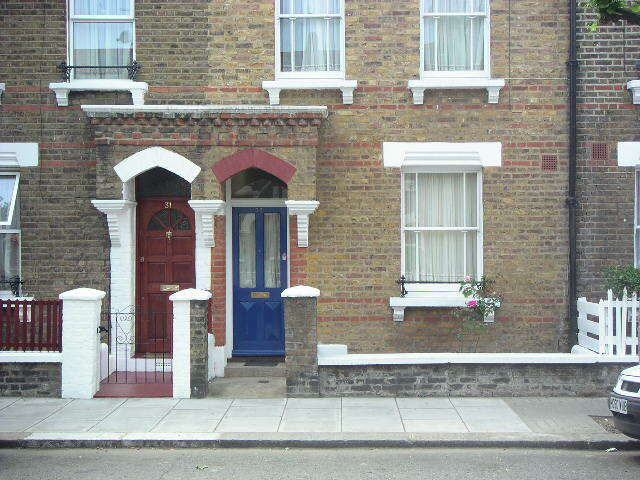 The corner house has inappropriate aluminium casement windows. 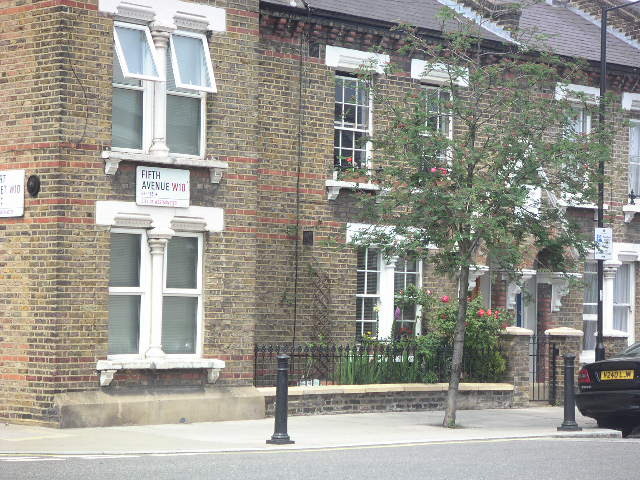 The house on the right has been fully restored with authentic sliding sash windows retained, and all the ironwork replaced. 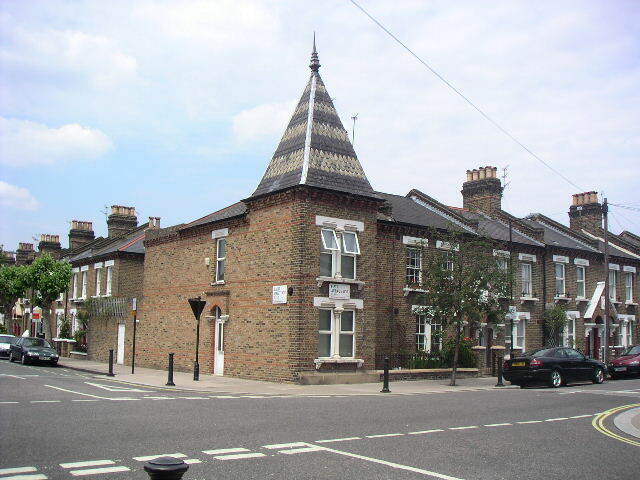 And what a corner house! The corner houses on Fifth Avenue have turrets! There are many surprising details on the estate. You will see masterpieces of ornamental brickwork, plaques and other things I'm too lazy to find the names of (architraves?) if you get a chance to visit the area. At the end of this picture down Caird Street, look closely at the terrace across the T-junction with Third Avenue. There is a gothic arch between two houses there. The availability of grants has not resolved this problem. 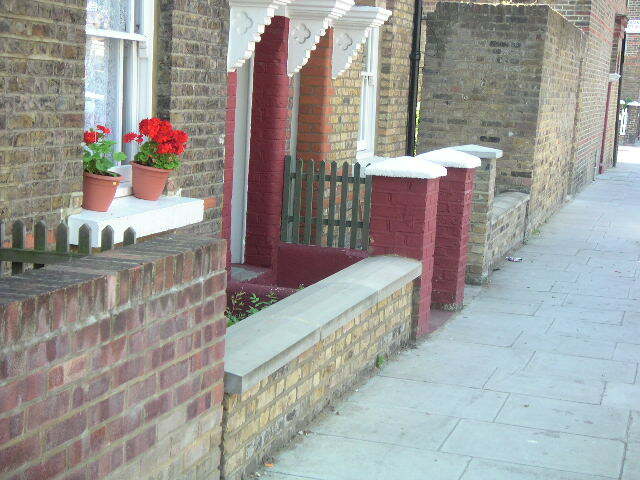 People still cannot afford the work, or would rather put breeze blocks and picket fences in place of the missing ironwork. The National Lottery could afford to do this, and would it not be a very good use at least comparable to funding of museums and sports facilities? An enquiry to them produced an application pack and details of the Townscape Heritage Initiative, which would be the way to go about this project. They don't initiate projects, but provide support and funding to local bodies, so Westminster City Council might be expected to organise this for Queens Park. But it would make more sense for the Mayor of London, currently a Mr. Ken Livingstone of Cricklewood (shouting distance from where this article is being typed) to take a leading role, as all London boroughs must be affected. We wrote to Ken Livingstone and received a response from an assistant stating that the work was outside of the mayor's remit. Eventually we wrote to Westminster City Council with our suggestion for a Townscape Heritage Fund project and received this letter from David Clegg, Head of Design and Conservation (North) in response.